Comparative study has emerged as the new frontier of constitutional law scholarship as well as an important aspect of constitutional adjudication. Increasingly, jurists, scholars, and constitution drafters worldwide are accepting that ‘we are all comparativists now’. And yet, despite this tremendous renaissance, the ‘comparative’ aspect of the enterprise, as a method and a project, remains under-theorized and blurry. 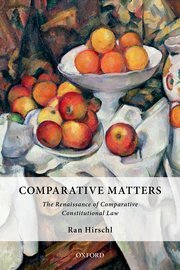 In his new book Comparative Matters: The Renaissance of Comparative Constitutional Law (Oxford University Press, 2014), Ran Hirschl addresses this gap by charting the intellectual history and analytical underpinnings of comparative constitutional inquiry, probing the various types, aims, and methodologies of engagement with the constitutive laws of others through the ages, and exploring how and why comparative constitutional inquiry has been and ought to be pursued by academics and jurists worldwide. Through an extensive exploration of comparative constitutional endeavours past and present, near and far, Hirschl shows how attitudes towards engagement with the constitutive laws of others reflect tensions between particularism and universalism as well as competing visions of who ‘we’ are as a political community. Drawing on insights from social theory, religion, history, political science, and public law, Hirschl argues for an interdisciplinary approach to comparative constitutionalism that is methodologically and substantively preferable to merely doctrinal accounts. The future of comparative constitutional studies, he contends, lies in relaxing the sharp divide between constitutional law and the social sciences.